If you’re a person with small hands who has looked around at local guitar shops to purchase a guitar, you may have noticed that you have struggled to find best acoustic guitars for small hands. But its all good! Not all guitars are made for people who have smaller hands! That’s okay, though, because there are short scale guitars on the market that are made specifically for people who have small hands. In a hurry? Check here the musical instruments you might take a look on. My Bottom Line Up Front: I personally prefer the Martin LXK2 available here as my top guitar for smaller hands. Continue reading to get the full story (and some other recommendations). What Should You Look for When Buying a Guitar That’s Meant for Smaller Hands? When it comes to the fingerboard on a short-scale guitar, you are going to want to purchase a guitar that has a string length that is between 22 inches and 24.6 inches. This is because it will be drastically easier you, the player, to take hold of all chords properly, because there will be less finger strength and less power needed in order to be able to play. Six-string guitars that have a smaller string length will also have a slimmer neck, which is one of the requirements that we have listed above. Having a slim neck on an acoustic guitar for small hands is also essential, for the same reason that having a shorter fingerboard is. The slimmer neck makes it easier for a small-handed player for grab onto the neck, making it easier to produce chords; slim necks are also great for guitarists who like to shred or play at a faster tempo. In order to get lighter strings, you are going to have to go with a smaller gauge. Light strings are easier to press and play in general. If you are an acoustic guitar player, try replacing your guitar’s steel strings with nylon to see a big difference in the playability of your guitar. All four aspects of a guitar meant for small hands does have an impact on the sound of the guitar. Short Scale Guitars that have smaller bodies do not resonate as well as guitars that have average-sized bodies, slim necks do not produce chunky sonic attacks, light gauge strings sound completely different than heavy gauge strings, and the material the strings are made out of also produces a different sound. Make sure that you test all of the different options out to see which one best fits your needs and the sound goal that you’re looking to produce. Now, I know what you’re thinking. ‘But, I’ve heard that people who have small hands and short fingers aren’t good at playing guitar.’ The best news is, is that’s a total myth! Yes, you may have been born with short fingers or small hands, but you can still be just as an amazing of a guitar player as Jimi Hendrix or Eric Clapton with the right guitar choice. Don’t let anyone tell you that you can’t be a great player just because of the size of your hands. Being able to play an instrument well all has to do with developing the proper techniques and understanding how music works, but nothing to do with finger length. What Should I Do if I Want to Play Guitar, but Have Small Hands? Right off of the bat, you should know that you’re going to have to learn how to stretch your hands more than other players. Stretching your fingers is something that’s going to take some work to get used to, but it’s well worth it once you have it mastered. There are daily exercises you can do that are actually very easy to memorize in order to help you to become more comfortable with stretching your hands. Never push your hands to the point where they are in pain. If playing a chord hurts, stop and take a second for your hand to relax. There are also several tips and tricks you can use to help make playing the guitar easier. Read down below to discover some new tips to help make your playing experience easier! It’s very easy to become overwhelmed by all of the choices of guitars that you can choose from while going shopping for your dream short-scale guitar. If you are a beginner, you are more than likely to get confused about all of the different speculations and information that manufacturers provide shoppers with. It can be even more confusing if you’re a beginning guitarist looking for a guitar that’s made for your body size! Whenever I happen to pick up and play around with a guitar that’s a ¾ size travel guitar, I always happen to expect it to not have the same type of sound that a full-sized guitar has. How can a smaller guitar produce the same sound that a full body guitar does? When I first picked up this Martin LXK2 Little Martin Acoustic, I was very surprised at the volume that this instrument produced; I have found that in a lot of the smaller guitars there is a brighter sound produced. However, with this Little Martin, I was shocked when I heard a deep sound produced. The deep tone that I heard is not common to find in small guitars and that is why I have fallen in love with the Martin LXK2 Little Martin Acoustic Guitar. A common problem that runs along many smaller sized guitars is that these types of guitars are marketed towards beginners, as many beginners are afraid of spending too much money because they don’t know if they are going to stick with the instrument. Because of this, many guitars that are marketed towards beginners happen to be cheaply made. However, Martin decided to stray from that path and make their smaller sized guitars from better quality materials. This guitar is a ¾ size, which means that the Martin LXK2 Little Martin Acoustic has a smaller body and a scaled down the neck. Martin’s LXK2 Little Martin Acoustic Guitar sports an original dreadnought body with a high-pressure laminated top, sides, and back. One of the biggest complaints that people have against the Little Martin LXK2 is that they use HPL (also known as High-Pressure Laminate) to construct the guitar. In other words, HPL is also known to be plastic that’s designed to look like wood and that’s part of the reason why the pricing on this guitar is so cheap. However, if you didn’t know this before playing one of the Little Martin guitars, you certainly wouldn’t have noticed, as it doesn’t show it in the way that it sounds. Besides, laminated guitars tend to be more durable in comparison to guitars that use real wood. The bridge and the fretboard of the LXK2 Little Martin are both made from rosewood; the neck of this guitar is carved from stratabond. For more information on the Martin LXK2 Little Martin Acoustic Guitar, read my full review here! 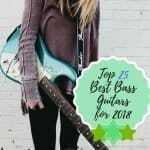 Entry-level guitars, especially electric guitars, you need to know what you are looking for, what you want, and what exactly you should buy. There are guitars out there that are cheaper than dirt but aren’t worth much. However, the Epiphone SG Special Electric Guitar is not one of those guitars! While it is priced under $200, it has amazing materials used in the composition of the body. One of Epiphone most popular models from their lineup is the SG Special, as it has been seen in the hands of some of the most legendary guitar players. However, it’s also a popular model among players who aren’t so famous and that’s because it’s a guitar that fits within a beginner’s budget. This Epiphone SG Special is an entry level model and the hardware that comes with this guitar is the same that would come with any other entry level guitar Epiphone produces. All of the hardware on the SG Special is chromed, which gives a cosmetic contrast between the darker color of the rest of the body. 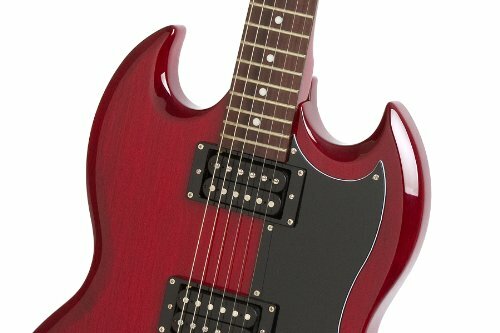 Epiphone’s SG Special Electric Guitar comes with a KillPot switch, which mutes the guitar for a second when pushed; this provides the guitarist with the ability to manually effect the sound of the guitar. It’s actually a really fun button to play with and experiment with. The Tune-o-Matic bridge and StopBar provides the SG Special with decent sustain, as well as tuning stability. The contour of the body and neck makes it comfortable to play at a faster tempo and not strain your hands. The Epiphone SG Special was born when Epiphone decided that they wanted to make their own double cutaway solid guitar. The body of the Epiphone SG is made from an alder and maple laminate, while the neck is comprised of a standard maple unit. If you love the Epiphone SG, the SG Special is everything you love, just packed down to a smaller size. While there are several choices of finish you can choose from, the red and black combo or all black are the two more popular choices. If you have ever seen any video of AC/DC’S Angus Young walking across the stage to perform in his school uniform, there is a large chance that you’ve seen the Epiphone SG Special guitar! George Harrison, Frank Zappa, Angus Young, and Jimi Hendrix all have played the Epiphone SG; the Epiphone SG Special is the same exact guitar, with a smaller body and a smaller price. The sad thing about the Epiphone SG Special is that it’s one of those guitars that is super controversial- there are a lot of people who claim this guitar to be a complete waste of money. However, when judged on the total makeup of the guitar, the Epiphone SG Special is a guitar that’s not only affordable but is an instrument that will grow with you as you become a better musician. Overall, this is a guitar that will absolutely appeal to many new players, but there are plenty of reasons for any experienced player to enjoy too! Need to know more? Read my full Epiphone SG Special Electric Guitar review here! Even just serving a quick glance at the Eastman E10P Parlor Acoustic Guitar, you can tell that you’re right next to an instrument that’s high quality. While it may be a small size, Eastman certainly made sure that this guitar was not made from low-quality materials or poor craftsmanship. While it is going to cost you around $1,000 to purchase one of the Eastman E10P Parlor Acoustic Guitars, it’s a parlor sized guitar that serves to be a quality instrument that you can use for all music styles and genres. The E10P Parlor is known to be a guitar that is extremely easy to play for people of all sizes; it’s an instrument that is easy to hold and feels lightweight. The neck and the fretboard are half of an inch below the standard dreadnought length, which makes this guitar play like a real gem no matter the player’s size or preference in style. So, what does the build of the Eastman E10P Parlor Acoustic look like? Well, if we’re just talking about the mere looks of this instrument, the sleek look of the front combined with the fiery back size of this guitar makes it very obvious that you are handling an expensive acoustic. This six-string beauty has a solid Adirondack spruce top, with solid mahogany sides and back. 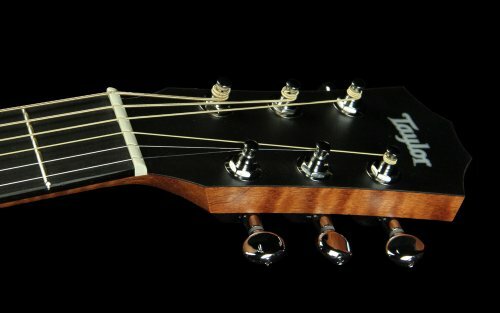 A sturdy mahogany neck sports a high-quality ebony fingerboard that has been designed to reduce fret noise. The E10P has a 24.9-inch scale length, with 19 total frets. While the hardware of the E10P isn’t the most complex, each component that does contribute to this guitar are still in top form; each component has been carefully assembled to ensure that this six-string beauty stays in proper shape for years to come. The Eastman E10P Parlor Acoustic Guitar has a pack of six chrome vintage open-gear tuners, a two-way adjustable truss road, a hand-fitted dovetail neck joint, an ebony pyramid bridge, a nut width of 1 13/16 inches, and strung with a pack of 012-054 Martin SP Phosphor Bronze guitar strings. Eastman made sure to pay special attention to their E10P Parlor to ensure that there were no flaws in the craftsmanship or any buzzing noise in the neck or the fret, which is a common problem among smaller sized guitars. This is a guitar that I would choose to play over other name brand guitars that cost the same, no matter what their size is. I have found that with some of the guitars that Fender, Martin, and other brands produce, that while the price tag is in the $1,000-$2,000 ranges, the guitars still play like a guitar that costs a third of that price. This Eastman E10P is a wonderful exception, though. You may be questioning the true versatility of this Eastman because it is a parlor guitar, and parlor guitars are famous for being played in the blues genre, this Eastman is way more versatile than any other parlor guitar on the market today. When fingerpicking this guitar, this beauty responds with crisp, bell-like tonal qualities. However, if you decide to strum the strings with a flat pick, you do not receive any sound distortion or string buzzing. While the price tag may be a bit higher than the beginning guitarist is willing to pay, it is most definitely worth the price tag. If you are looking for a high-quality acoustic guitar that has a sound that will fit many different genres, the Eastman E10P Parlor Acoustic is certain to deliver. Just the experience of being able to test this beauty out was quite the pleasure. While many people don’t compare Eastman to top brands like Fender, Taylor, or Martin, I find that this guitar is worth the smaller investment compared to top brands like that are going to ask from you. If you want to find out more about the Eastman E10P Parlor Acoustic Guitar, read my full review! 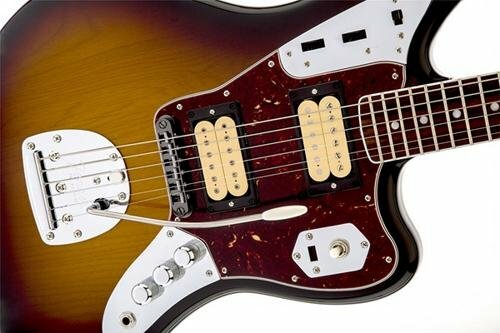 The Kurt Cobain Jaguar is comprised of a maple neck that has a bound rosewood fingerboard that has a “C” shape, with a 24-inch scale, and 22 frets. While the short scale may feel a little bit off to Strat players, it helps to bring together the Jaguar’s edgy sound. 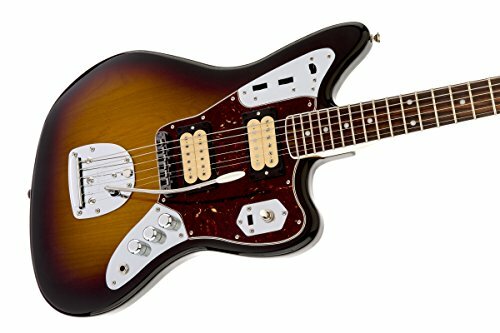 The tremolo tailpiece is copied right off of Fender’s original Jaguar Electric Guitar and their Jazzmaster. The controls on the Kurt Cobain Jaguar are a little bit more complicated in comparison to the typical Fender. When looking to purchase a Fender Kurt Cobain Jaguar Electric Guitar, make sure to check the year that it was produced. When the first version of Cobain’s Jaguar was released in 2011, Fender finished the guitar with a ‘worn’ look to it, with scrapes, bumps, and dings. However, after re-releasing the Kurt Cobain Jaguar Electric Guitar, Fender began to finish their guitar with a gloss polyester coat. I would suggest the Epiphone SG Special Electric Guitar; it has a similar cosmetic look and is comparable with the sound quality. The only major difference between the Epiphone guitar and the Fender is the price; $200 vs $1,200. However, if you happen to be a collector, someone who likes to play a large variety of guitars, or a performing artist, I would recommend this guitar. It’s comfortable enough for people with small hands or small statures to play; it’s built for people who are smaller but does not compromise on the integrity of the sound. For a full review of the Fender Kurt Cobain Jaguar, read my ultimate review here! At some point in time, most dedicated musicians, whether they be beginners or professionals, have a small pipe dream of owning a Taylor. The reason why it’s mostly a pipe dream from most musicians is that of the price tag- paying $1,500 or more for an acoustic guitar just isn’t in the budget for most people. If you are someone who can’t afford the $1,500 price tag that comes with buying a full sized Taylor, spending $300 for a ¾ sized Taylor probably seems to be more reasonable. But, as some people have learned, just because a guitar has a top name brand branded on it, does not mean that it’s truly worth the investment. Personally, I would not suggest this guitar to you if you perform as a way to make your living. Just because the Taylor name is attached to the instrument, doesn’t mean it’s the best thing for a professional to purchase. However, if we are talking about purchasing a guitar that offers a decent sound while also being easy to travel with, the Taylor BT2 Baby is an instrument that you should look at. The ¾ sized dreadnought body sports a real tropical American mahogany top, with laminated Sapele sides and back. The shape of this Taylor has been refined a bit; the curves at the top and the bottom have been softened so it sits easier in the lap. The scale length is 22 ¾ inches and the ebony fingerboard with 19 frets attached. 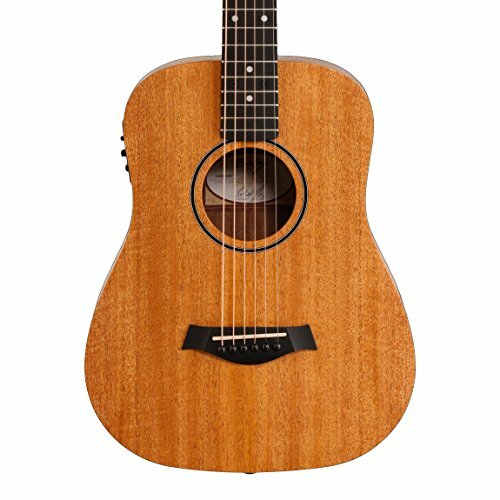 The most distinctive feature of the Taylor BT2 Baby Acoustic is the mahogany. It’s well finished and is certainly eye-catching. It is a known fact that smaller guitars are harder to properly manufacture, due to their smaller size; smaller guitars are more fragile in comparison to full bodied guitars. The laminate back and sides do not provide this guitar with amazing tonality. The laminate also makes the Taylor BT2 Baby feel cheap, as laminate on most guitars does. While the Taylor BT2 Baby has been advertised to produce large and full tones, I tend to disagree with that. However, I did notice that the projection for singular notes, arpeggios, and chords are distinct. When chords are strung with extra force, the resonation tends to become a bit muddy. In just a brief summary, the Taylor BT2 Baby Acoustic is said to be a delight to play for players of all different levels. However, I would suggest this piece to professionals who enjoy the sound of the BT2 but know how to properly take care of a guitar. There are other guitars out there that are cheaper than this guitar and that produce better tonal quality. 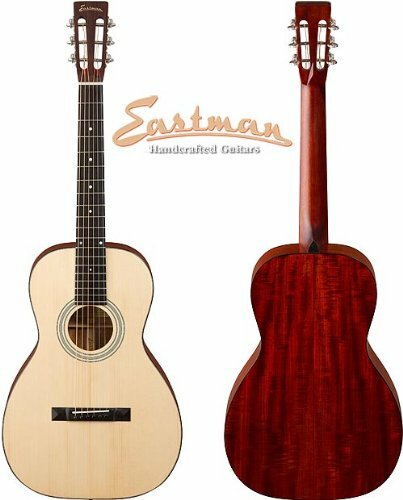 I would suggest checking out the Eastman E10P Parlor Acoustic Guitar if you’re really interested in finding an acoustic guitar that’s easy to use for people who have smaller hands. It’s a lot cheaper, has better sound quality, and is very popular among people who tend to gravitate towards playing on smaller guitars. If you want to know more about the Taylor BT2 Baby Acoustic, read my full review here! Love to know all about guitars, but hate reading? Don’t worry, we feel you. Check out this master comparison table to get all of the quick, important facts about all five of the guitars that we suggest for players with small hands. Top wood, and fingerboard material. At the end of all of the reading that you just did, I hope you have learned something about small-scale guitars. Before going online and definitely deciding upon a guitar that you want to learn on, make sure that you take a trip to your local music or guitar store to take the time and decide on which instrument you feel most comfortable with. 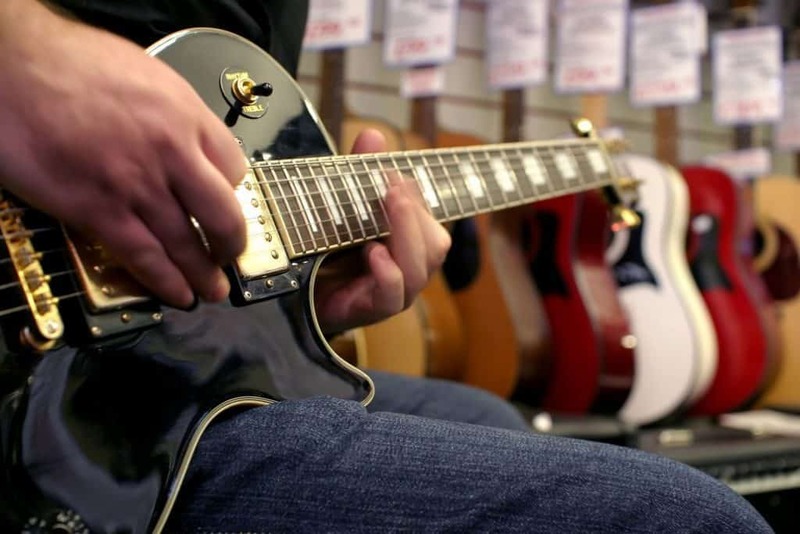 It’s not guaranteed that the closest shop to you will have the guitar that you are looking for, so try calling up the shops around you to see if they have what you’re looking for before making the trip down. While the process of shopping for a guitar that’s perfect for your needs and wants may take a while, there is a guitar out there that’s perfect for you! Whatever guitar you do happen to decide upon, just remember that you’re not going to sound amazing at first. Practice is the most important key to remember in order to sound amazing on a guitar!